Happy Easter, everyone! Guess it’s about time I admit that my previous post was just an april fools, right? It’s been 20 days already after all! Well, there are reasons why I couldn’t do it. Two actually, if you disregard obstacles due to real life! The first one is that I’m currently trying to get used to an alternate keyboard layout called Neo². You’ve never heard of it? We’ll that’s actually quite likely as it is neither well-known nor in wide-spread use – even in my country. It’s basically an ergonomic keyboard layout optimized primarily for the German language (but also well fit for English as many of us frequently use that language, too). It uses six(!) layers and quite some dead keys, thus allowing for many, many more characters that you can type with it. Have you heard about dvorak (wikipedia article) for example? Then you know the basic idea of rearranging keys (and the advantage of having more characters easily accessible, like e.g. the whole Greek alphabet, is pretty obvious). And the second reason is… that most of what I wrote was not actually an april fool! Ok, some of it was. While the size of the TinyCore kernel is true (I really built it), I do not intend to use it as the default kernel. Also E5 won’t switch to musl – because I consider E5 a project on halt. What IS true however, is the fact that I’ve been experimenting with musl for quite a while now. In fact I actually plan to build another experimental Arch-like system which will be based on musl. This is clearly the most challenging experiment I’ve made so far. Many standard packages are tested only with glibc and may require excessive patching to play together with musl nicely. 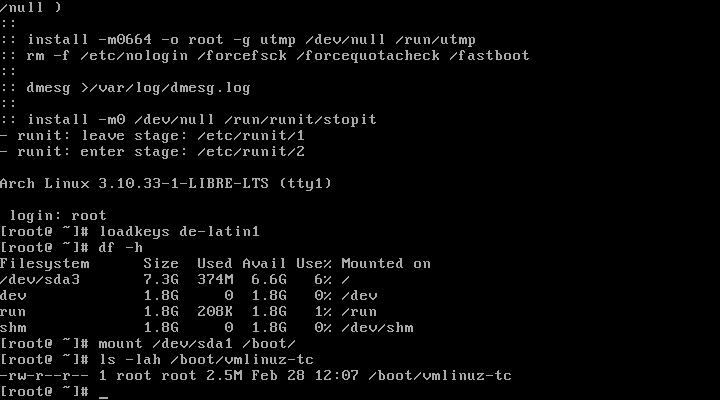 Fortunately one of my favorite Linux distributions, Alpine Linux, decided to switch to musl! Thanks to their experience with µclibc – another alternative libc – it’s without question that they have the technical knowledge to make this happen. I have been very excited since I read their announcement and had been following the “edge-musl” branch closely. Now only ten days ago they dropped the “edge-musl” branch. First I was shocked. But then I realized that musl is now the standard libc for “edge”! Alpine has been a great resource for me while I was trying to build an Arch system on musl. Musl is also available on Arch thanks to the AUR, but there it’s only a secondary libc installed with a different prefix. It’s meant more or less for static linking only. The great news: There seem to be quite a few people around who are interested in both Arch and musl. So why not combine the two? Then it took a few weeks to get pam and logging in working and runit (the init replacement I’m using) to spawn some tty… Welcome to a bare system that won’t provide much more functionality than just coreutils and the like! Next I added a text editor so messing with configuration files became easier and prepared all the dependencies for pacman. There were quite some struggles along the way but in the end I succeeded: Eerie has pacman now! The logical next step was adding the basic development packages. Most of them even built without any special means necessary. However GCC proved really troublesome to build. I was stuck on that one for weeks (and even though it were weeks with little time on my hands, it proved to be a real blocker). In the end I gave in and used what Alpine provides (did the same thing for gcc-libs before, anyways!). So I at least have a working GCC. Getting the net to work has been giving me the creeps. I have failed to get xinetd to compile against musl and I’ve also failed to find an alternative to it that would do the job instead. Now I know why many distros use busybox together with a dhclient script… Definitely have to take a look at how Alpine does it, but I’m not really knowledgable about openRC and would like to look into that one first. Maybe I’ll find a little time for that soon. Who knows. The most important thing is that network connection with EERIE is possible. I’ve built a few packages natively on my EERIE system but most of them were built externally. My goal is of course to be able to build all of them on EERIE and thus make the project self-hosted. So far I’ve done all my projects in a semi-open way. I came up with an idea and tried to cook something up behind closed doors. When I thought that it was ready, I made it public and that was it. However these projects were more or less personal experiments that I shared with anybody who might care. Now I’d like to take the next step and set up a project that’s actually useful (while still being experimental for the forseeable future). For that reason I set up a repository to store all PKGBUILD files for EERIE using a DVCS (distributed version control system) called Fossil. It’s way less known that e.g. git, mercurial, etc., but it provides some nice extras. Look here for a little how-to on cloning the repository. 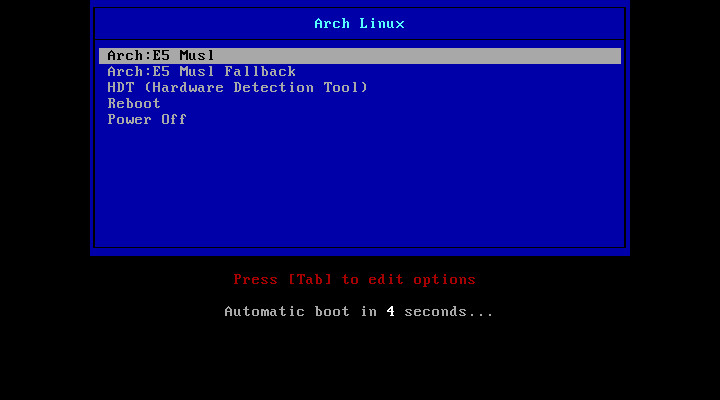 Building an Arch-like Linux distribution on musl is a gigantic task. For that reason I could really use any bit of help I can get. If you care for Musl and like Arch, please consider supporting this project. And no, I’m not asking for money. If you think you have a bit of free time on your hands and the skill (or will to learn since that’s what we all start with) to mess with package building, just get in touch with me! Oh, and even if you don’t think you can help by making more packages available, you may just invest the one or two minutes that it takes to write me a comment here and show some interest in the project. That would also help and is greatly appreciated! I’m busy getting the repos with binary packages up so that an EERIE system can be pacstrapped. I’ll try to make a release announcement as soon as possible. Probably in early May. Please bear with me! Arch:E5 ditches eglibc and goes for musl libc! Those of you who follow the development of Linux for embedded devices (or simply older hardware) will probably have noticed, that eglibc is effectively dead. According to their website “EGLIBC is no longer developed and such goals are now being addressed directly in GLIBC.”! Arch:E5 was built to be a bit lighter than todays mainline Arch. To do just that it’s obviously necessary to deal with the root of the trouble (yeah, a pretty lame pun, I know). The standard C library is – together with the kernel – the very heart of every Linux distro, that’s for sure! And since ordinary glibc is quite a memory hog, eglibc was a pretty self-evident choice to keep things a little smaller and prettier. But as this variant of the GNU C library will cease to exist after the 2.19 branch, E5 had to look for alternatives. There are actually quite a few alternative C libraries around. Dietlibc for example. But it’s primarily meant for static linking. Yet there are more candidates. Like µclibc. A pretty nice libc actually which is also already proven and tested: There are even a few distributions built upon it. So could that be an option for E5? Nah, not really! Wanna know why not? ’cause it would be rather boring. And even worse: It has already been done for Arch and is even described in its own page on the ArchWiki! So – is E5 doomed to eat humble pie and return to glibc, losing one of the main characteristics which made it diverge from mainline Arch? But no, fear not dear brethren! Luckily for us there’s also Musl, a rather young libc which you may not even have heard of. It has reached version 1.0 just these days and thus it practically calls for being used in place of our old C library! There are a few distros already which are based upon musl. But everything’s experimental and pretty much a mess to work with. In other words: Absolutely ideal preconditions! I’ve been secretly working to make E5 run with musl as the distro’s libc for about two weeks now and just a few minutes ago I succeeded in getting E5 “Musl edition” to run! It was quite a bit of work and took quite some time. So far I have not spoken a word about it with anybody. But today’s the big day to announce it to the public! While I was at it anyways, I thought that I might change the kernel as well. Ok, I have to admit that I’m still not cool enough to use some BSD kernel. But it’s clear that E5 (being an experimental distro!) needs something more… extraordinary. In the end I settled for a minimalistic Linux kernel by compiling one with the kernel settings from the TinyCore Linux project. Arch:E5 Musel with a TinyCore-like kernel! The logical next step would be publishing an E5-Musl repository, wouldn’t it? ?